This past month has been really crazy with all of the podcasts, but I’m finally catching up with my New Books in Astronomy interviews. 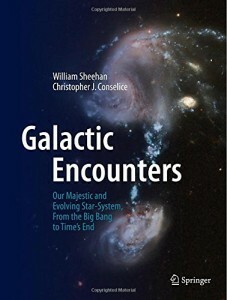 In the latest episode, I talked with William Sheehan and Christopher Conselice, co-authors of a new book called Galactic Encounters: Our Majestic and Evolving Star-System, From the Big Bang to Time’s End. I really enjoyed the book and I was very happy to be able to speak with both of them together. Sheehan and Conselice bring their complementary backgrounds in history, psychiatry, and astronomy together to present both the current understanding and historical context of investigations into the nature of “fuzzy” objects in the night sky, from distant nebulae and galaxies to our own Milky Way galaxy. A couple of my favorite chapters have to do with E. E. Barnard and early astronomical photography (Chapter 7) and W. W. Morgan and how he recognized the spiral structure of the Milky Way (Chapter 12). But there’s a whole lot more, from the Herschels to Hubble and on to dark energy!